Our patented insulated cooler design evolved as a result of our determination to ship perishable food in longer transit times cost-effectively…..any time of the year. We wanted to eliminate the problem of coolers breaking during transport and we knew the carrier drivers were not going to “handle with care”. Our 6-panel design is engineered to prevent breakage during transport because the stress that results from axial and lateral impacts is absorbed in the flexible joinery. The walls of our coolers are a full 2” thick. The obvious benefit is superior insulation with an R-Value of over 8.0. The hidden advantage is that our coolers satisfy the packing requirements of the postal carriers, specifically, 2” of cushioning around the product. This means that UPS and FedEx will honor an insurance claim if the package is destroyed or if the contents (such as glass containers containing food) are broken. Our interlocking joinery prevents the panels from floating, which maintains uniform thermal protection during transit. We can manufacture coolers to fit any size box, and there is never an extra set-up or retooling fee. Why is this important? Two reasons. First, consider that when shipping perishable products, air is your enemy. You want your product and refrigerant to fit in the cooler without any extra air space. 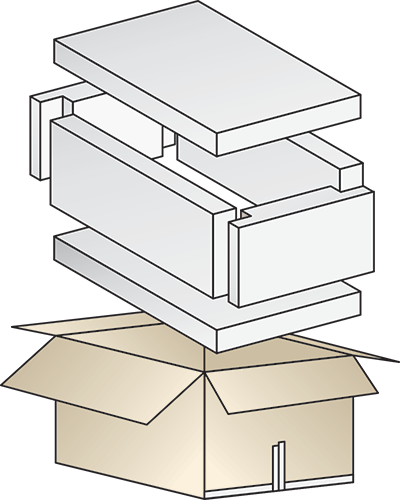 Second, in 2017 UPS and FedEx carriers changed the manner in which DIM Weight (Dimensional Weight) is calculated. Regardless of the carrier, you will pay the higher rate of either DIM Weight or Actual Weight. The old formula for DIM Weight was (length x width x height)/166. Thus, an 18” x 16” x 12” box would have had a DIM Weight of 21 pounds, which would be the minimum that you would have been billed. In 2017, the formula changed to (length x width x height)/139. That same cooler now has a DIM Weight of 25 pounds. So, if the Actual Weight of your shipment in an 18” x 16” x 12” cooler is 18 pounds, you will be billed for a 25-pound shipment. Make sure you have the right size coolers on hand. If you give us the size of the product and desired transit time, we can recommend the correct size. Our 6-panel coolers positively affect both delivery and storage. Our competitors pre-made cooler measuring 24” x 16” x 12” takes up 2.66 cubic feet of space. That same size cooler made by Good Vittles stores flat takes up just 1.67 cubic feet. That’s about 59% less. This means that we can put quite a bit more on a pallet and you use far less space at your storage facility.